En et-værelses mezzanin med en-suite showeroom. Herunder privat terrasse og parkering, veludstyret køkken og åben planløsning. Beaulieu Gites er omgivet af vinmarker, gamle skov og endda en Tor. Beliggende mellem Villefranche de Lonchat og Monpeyroux, med Bordeaux og Bergerac er mindre end en times kørsel væk. Vores to Gites er ideel for par, der ønsker at komme væk fra stress og jag i livet at opleve fred og ro. Hver Gite indeholder en mezzanin soveværelse med en-suite badeværelse, linned, bad og pool håndklæder leveres. Et rummeligt åbent opholdsstue, stereoanlæg med bluetooth docking, veludstyret køkken, en nespresso kaffemaskine, en gratis flaske vin, gratis trådløs internetadgang og en privat terrasse, der fører ud på acres af smukke landskaber, der kort afbrydes af en fantastisk pool (10 meter med 5 meter i størrelse) og opholdsstue. For naturelskere og kunstnere både vi har 4 naturlige damme, der er forår fodret. Teaming med vilde dyr såsom isfugle, Terrapins, Guldsmede, sommerfugle, rørhøner og meget, meget mere. Hvis du ønsker at vove sig ud og opdage det lokale område, du vil finde nogle af de bedste dag og nat markeder, vinmarker, brocantes og historie, at Frankrig har at byde på! Vi kan arrangere en tur og smager rundt om en lokal engelsktalende vingård. Vi tager også højde for kunstnere og naturelskere, der ønsker at blive inspireret, så tag med dine lærred og kameraer. Plus kan vi også organisere Bike Hire, der leverer og afhenter til ejendommen. We were lucky with the weather but it is a most relaxing spot regardless of the weather. Our cottage was the one with the walled terrace with a wonderful view of the sky. And 25 yards away the small ponds with the fish and frogs and a very friendly toad were a delight. And then of course our hosts, and not forgetting their very friendly dogs with the expectant eyes and the cat. It was a most relaxing stay and Bibi and family have a very attractive home. It was the ideal place for wine drinkers, betwixt and between Bordeaux and Bergerac. Who needs TV when you have the stars. Many, many thanks. Beaulieu supassed all of our expectations and more. Our plan was to have a relaxing ten day break surrounded by nature and to explore the surrounding area with its markets and villages. When Bibi showed us our gite we knew that we had made a great choice the gite had been decorated to a very high standard and was spotlessly clean. We felt at home from day one and this was due to the relaxing atmosphere here and the fact that Bibi and Fin were on hand as much or as little as you wished. We spent our days by the spotlessly clean pool and the nights in the privacy of our own patio eating, drinking and star gazing. By the end of our ten days we were totally relaxed and felt sad to leave. We will definitely go back to Beaulieu and soak up some more of this wonderful part of the world. Thank you Bibi and Fin. setting with a great pool. We loved it. Bibi and Finn could not have been more friendly and helpful. Highly recommended. Bibi & Finn are the perfect hosts. There when you need them, always willing to assist with any requirements, but also respecting your privacy. 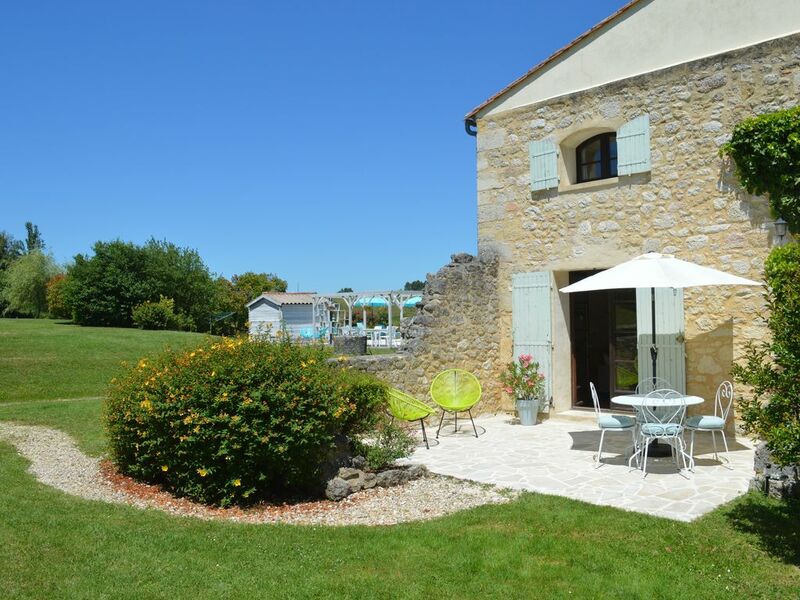 The location is wonderful, the gites are well equipped and very comfortable for couples and the swimming pool was a life saver in the 30`+ daily heat. There is plenty to do and see close by and it is easy to get to the coast. Good local restaurants, vineyards aplenty and a multitude of wildlife. We enjoyed it so much, that we booked to go back next year before we left. Vi er velsignet i Dordogne at have nogle af de fineste vine i verden på vores dørtrin, der ville tisser pallen enhver feinschmecker. For den nysgerrige blandt os er den sydvestlige del af Frankrig gennemsyret i mysterium og historie, kan timer gå tabt og spekulere omkring de lokale byer St Emilion, Sainte Foy la Grande kendt for det marked eller de vidunderlige byer Bordeaux og Bergerac alt inden for en time Kør væk.